Mac Cabre's son. An outlaw mercenary, and good friend of Gaunt. Gaunt's pet lizard. Hangs out in Munden's Bar most of the time. The best fighter the Arena ever saw. After he retired from that gig, he became a crimelord in the Pit. He put together an army out of the poor and the Arena gladiators and tried to take over the city in the Dancer's War. One of many babes with a grudge against Gaunt. 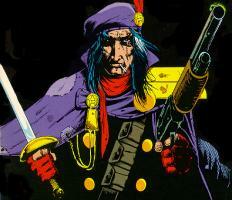 Gaunt is the first incarnation of Grimjack. BlacJacMac's woman. She is in fact a real goddess in her home dimension. Dislikes Gaunt, because he's always getting her man messed up. Jericho Noleski's girlfriend. Heyman, Noleski, and Heyman's husband were all in the Free Marines together, and the husband was killed in Dancer's War. A really nasty robot. Likes to wear human skin as a disguise. Often in league with the demons. Trained by Dancer as a living weapon aimed at Gaunt. Thinks Gaunt killed his father. 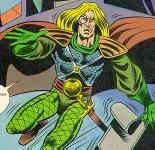 Gaunt kills him, but at the end of issue 31, he learnes that Katar was actually his own son. One of Gaunt's few real enemies. 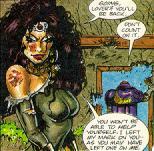 A tantric witch that Twilley consults occasionally. Father of Rhian, and a minor god in Pdwyr. TDP biker cop. Former Free Marine. The one great love of Gaunt's life. She lived in Pdwyr, which was destroyed in the Demon War. Gaunt's old partner from his TDP days. Gaunt's occasional girlfriend. She's pretty and doesn't demand much. Only real drawback to the relationship is that she's dead. 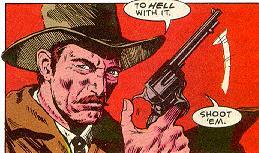 The second incarnation of Grimjack.